Michelle I’ve said it before but you’re an inspiration. To leave a promising career for the unknown like that takes a lot of guts. It’s clear you are living the life you were meant to live (ooops didn’t mean to get too Oprah on you). I *know* you get it, and yes, without getting too woo-woo about it, I really do feel that things just happen the way they’re meant to. Some of us make it look like it was all so obvious…but that’s because we’ve listened and rode the wave, right? Life circumstances often make that difficult to do, but for me, it was certainly worth pursuing…. I really think that you (and NYC ragazza) did an amazing thing by leaving your successful lives behind to live your lives as you wanted. importantly also pursuing it! you did and that’s an accomplishment on it’s own! Now on a lighter note : I agree with your answer on the second question. My experience tells me also that some Italians get annoyed because of the inefficiency. They just might be able to relativate it more whereas myself I sometimes can’t understand because I compare it to the Belgian way of doing things. But I’m doing my best at letting it go! I think that now more and more people are questioning what they really want…more so than 20 years ago, I’d say. Hopefully this has a good effect on the world, with more people pursuing their passions and just being happier and projecting that. Your first answer is scary in its similarity to my own feelings, although I know we’ve been over that already. But, it’s just… scary. Re your second answer – I was just about to write a long thing here, but I decided I’m going to respond in a post of my own this week! LOL I find this a fascinating subject, especially because of my experience living here in Frenchieland for so long. I know what you mean about feeling like you belong somewhere. I had that same feeling very intensely when I first came to Molfetta. It was overwhelming, in fact. Like the universe was letting me know, this is your place, this is where you belong. And there wasn’t much I could do about it! I can’t agree more with this post. Life is too short. What you have done, NYC, and folks who haven’t left a location but left a bad job, etc. – finding what makes you happy. It’s so important. Exactly Jen–it doesn’t have to be such a dramatic change to be one for the better. Very interesting. I know when I went to Portugal two years ago that I could very well be happy in the villages that we visited. hmm. Michele, you have (as often happens) touched on one of my favorite subjects — the sense of being home. You beautifully and accurately describe the experiences of following a less-trodden path, come what may, without making it seem like the nirvana it is not. Hard to say what the driving force is behind feeling at home. There are so many different definitions that people have of home. I have lived in a wide variety of housing in my life (thinking about all the packing and unpacking I have done makes me tired) but the conscious desire to come to Italy and plant roots come what may felt like the only thing for us to do. I think my partner and I were both longing for home, but did not know how to look for it, where to find it. In fact, speaking for myself, the sense of uneasiness which I carried with me through most of my life led me to think feeling at home would never really happen for me. Having done this move, I can say my sense of being home differs now from how I had imagined it. But the uneasiness is no longer there. Maybe I am viewing this stage differently, like I am not just experiencing it, but I am unfolding with it, and therefore it has become the home which I always wanted because there is so much more of me in every wall, plant, fence and stone. With that I think that having it work or not work out as I imagined becomes less significant. This is what is. This life is not just what I do but it is also who I am. I cannot and do not expect it to work well all the time. Instead of just being an observer in my own life, judging it subjectively as good or bad, I have been molded and tossed around and embraced by the events of this phase and try to react in a way which brings me further down my own path. I don’t need alot of “things” either and that seems to be a very common thread for many of us who have made this kind of move. Definitely true on that last sentence, Diana, and the subject of home is something so intriguing to me as well; I could definitely write much more about it, and who knows? Perhaps I will. I hope you will too 🙂 I love your description of embracing events. Simply gorgeous. sorry, I spelled your name with one L instead of 2. I know better. No worries Diana, so long as you forgive me if someday I inadvertently change your name to Diane; I don’t know why I revert to Diane, but I always have to stop and correct myself on your site! Michelle — I’ve enjoyed all these questions and answers, but today’s particularly. It’s just an amazing gift that you found your place, and I love so much your appreciation for the blessing that it is and the good grace you have to be in charge of your happiness . . .and to take that as seriously as it should be taken! The story about all the violet connections is so amazing and how wonderful to have all those signs that were so connected to your dear grandmother. She would be so happy, I imagine, to see you at home there. Anyway thanks for your reflections. I always enjoy seeing what you’re up to! Look what you’ve started! I think that while many of us (expats) have had similar experiences, each of us has reacted and been affected in very different ways. I too think that building a life here was somehow in my stars and while I miss so much, this is home. It became even more so after my son was born. That gave me a whole new perspective on living here than anything else could ever have done. Love learning a bit more about ya! It’s folks like you that make me think, or know that I could live over there one day!! I always enjoy reading your posts, but these lately, answering questions, have been especially interesting for me. I can relate I suppose, to a lot of your feelings about your life, slower pace, small-town, etc., since I live in a little coal mining village in your home state (north and west though of your home area) and anyway, I love living here. I’ve lived in D.C., in the Baltimore area as well as Harrisburg vicinity too; been to Phoenix as well for two fairly extended stays and though I liked living in all those places, there is still, for me, no place like home -which is here and is where my heart is. I’ve often wondered though, if I had the opportunity ever to travel abroad, to Scotland or Sweden, home countries of my ancestors, if maybe I would feel a distinct pull to want to live there. On another note, I don’t know if you access my blog via Reader or not, but my Reader is not working properly -not updating my blog and I’ve had several posts up since July 31st. Irritating the heck out of me it is too cause my blog appears to be the only one on my reader not updating and I can’t figure out what is causing this mess either! So sorry about the feeds Jeni; I wish I knew more about it to help you! Anyway, thank you for sharing your thoughts on this; home is such a fabulous topic, isn’t it? Yeah, Michelle, I’m definitely among those who are enjoying the latest series of posts on more personal subjects. You’ve been a bit (though not TOO much) more reticent in the past… and it makes it all the more interesting for those of us who have gotten to know you through your writing. And speaking as an “inpat” (didn’t leave the country, but traveled across it), I have to echo the comments about questioning what you want and pursuing it. I firmly believe more people can do it than think they can – it’s just so important, for yourself AND for those you share your life with. That last point is *so* important. It’s a shame that we underestimate our impacts on our loved ones’ lives. Imagine if we each individually were truly happy…what a world…. I’m with Paul – I love these glimpses to the inner you. I have such an interest in your life, it’s kind of weird. Not weird, in the psycho way, but weird in the way of wanting to know what your grocery store is like, where do you buy dishes for your house, what the food products are like in the grocery store, what you watch on TV…just the normal parts of life. And I agree with the not needing much thing – I feel the same way being on the road and in the truck. We have a very limited amount of space and although going home to get stuff is never a problem, I find I don’t need it. I change out my summer and winter wardrobes (but keep a little from each season because you never know whe you’ll be swimming or sledding – can happen in the same week sometimes!) but as far as the other stuff that one keeps in a home and uses on a daily basis – I usually wind up bringing things back home because I find I don’t even use them. Also – I’m trying to talk Ed into taking a year off to go live in another country. He always says “Sure!” but it never takes place. Maybe this will be the year…..
I’ll keep my fingers crossed for you! Would be a fabulous adventure for sure. It *is* amazing how little we actually *use* isn’t it? I’ve had boxes packed away here for months and only dug into them a few times…that definitely tells me something about what’s in them! Thank you for a very interesting post..love learning more about people. Yes your photo looks crisper in Flickr. It is amazing where you live…..so far up, and so many houses together. anne’s last blog post..Latest Art/Ceramic work. i just clicked on the pic and i love that you’ve pointed out exactly which house is yours. so very cool…..how big exactly is your house? I know that (esp. in Italy) looks from the outside can be deceiving. Eryn’s last blog post..My Weekend…..plog! Actually I’m moving Eryn, so the house is so *not* in condition for photos right now! The house is 60 sq meters; three rooms on three floors. The soul’s home… is there are term for that in Italian? Some Latin based version of it in one of the romantic languages? I am so very glad that you’ve found yours. Truly contented, happy and loving life… all of it, with lemonade by the sea, in the sun and under the stars. Brava Cara… so very happy for you, and proud of you for being brave enough to make your life what you want it to be. So many people don’t do that, and I cannot imagine living a life in shadows of dreams. Happiness is what you make of it. It’s there to be had, if one chooses to enjoy it, in every little nuance of life. Ah in the shadow of dreams…no, doesn’t sound like a fun place to me either. The soul’s home…I don’t know of a really great Italian way to say that…l’anima è tornata a casa…there’s surely something more poetic and less directly translated though. I really envy you for having just gone and followed your dream. It must not have been an easy thing to just leave a good job and “home” to start fresh somewhere completely foreign, even if you felt comfortable in that village! I never gave where I live much thought until just recently. Lately I KNOW that where I LIVE is not WHERE I AM MEANT to be…but now it is complicated, I am married, not the bread winner, and have two girls. WE moved alot with my husband and with my now 14 year old. Now she is about to enter High School. We need to stay put, but both hubby and I agree that in 4 years we will find our spot. Our younger one will only be 7 so she will be ok to still move…..What I am trying to say is that I ADMIRE you for what you have done!!!! Hi — I have been a lonnnnggg-time lurker, ever since you were sognatrice in fact. I used to write a beauty blog (beautymusings.blogspot.com) but have expanded it to more of a lifestyle/balance blog. My resolution with this blog was to delurk on all the blogs I am reading 😀 I love reading your blog for so many reasons — it’s inspiring and you have a great tone. But another reason is that I speak Italian (though to be fair am very rusty at this point) and love to read about life in Italy. My mother is from the Italian part of Switzerland and we used to travel there a lot when we visited her family. I have never been as far South as where you are so it’s always a treat to learn more. So great to see you Valerie! Congrats on the new blog and on delurking 🙂 I hope you’ll enjoy blogging a lot more this way…I know I do! And come on, now, it’s all about the lemons. 🙂 Of course, I think limes are better, but what do I know. I answered my own questions this evening. Thanks for the idea!! So happy to see your answers Chel! You have the most refreshing view on life, and I know that wherever you would have ended up living, you would have been happy, because it’s just in your personality to appreciate the things you have. That said, I really see how you were “meant” to end up in Calabria…and we’re all blessed for it, because you share it with us. It’s wonderful reading about that wonderful life of yours. The question about life being less rushed and stressful…….oh my, as soon as I land in any Italian city, I am instantly transported back to a simpler time…..like the 50’s, yikes!….I was here in the 50’s. 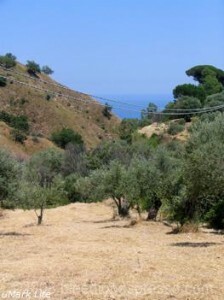 When you came to Calabria, did you initially live with a family or find an apartment right away? I know your village is small and I am curious how you found a place to him, because small villages = small supply of available housing – at least in my experience. My mother grew up in a village in Ticino that today has 1600 inhabitants, but had more like 1200 in the 1980s (when I spent most of my time there) — and there were maybe two available apartments or houses at any time. Often, people who were from the village, went to a big city (Zurich, Geneva, Milan, Rome) for a few years, and then came back to settle down would move back in with their parents because of lack of available housing. If they wanted a home of their own, they often would HAVE to build a house, or renovate a really old one that no one had lived in for a long time etc. Fortunately, there are some enormous quarries in Ticino (and, IIRC a brick factory), so if they went with local materials, it is doable. Plus these houses are small — a big house has 900 sq feet there. My grandparents’ house is probably about 650 square feet of living space, but has the typical cellar and attic to help with storage space. 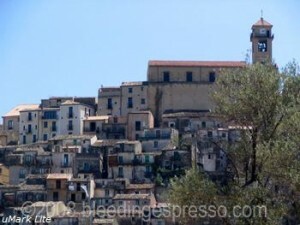 Oh there’s *no* trouble finding housing in most of the medieval hilltop towns in Calabria…they’re nearly all abandoned! Some of the properties aren’t really in living condition, but there’s definitely room. I bought a house, which I wrote about in The House of Violets. As a Libra this lifestyle would suit me just fine! In fact living in Chicago for 16 years finished me off. Enjoyed reading your thoughts about this subject and Calabria. Thanks! I just wanted to let you know that I’m really enjoying this series on your move to Italy. Sometimes your heart knows just exactly what to do even if it takes your brain a bit to catch up. I love stories where people follow their heart and it leads them to an entirely new life. Thanks so much for taking on my question and answering it so beautifully! I’m really fascinated with this topic of home, too. Well, you know, I’ve talked to you about it endlessly. And it helps to know that it’s a theme among Libra people. I keep dreaming up my life in three places – something like, summer in Maine, winter and spring in Italy, some time down in New York/New Jersey with my friends and family. Diana, your comments really resonated too… and you should write a blog! But Michelle, I’m still shaking my head amazed at your going to that village knowing not a word of Italian (of however the story goes) and just having your life blossom . . .
Oh, and I don’t see why you couldn’t live in three places, so long as financially it’s feasible! I know I’ve said it before but you are a great example of keeping a positive outlook, and yeah I know it’s not always easy to do but you still push on. I think it’s such a blessing to have P, his family and some great neighbours. Good on ya for making lemonade (and other things) with life’s lemons. Thanks Collette 🙂 I think at some point, you realize that dwelling on the negatives really just makes everything worse–or at least I did.